Editor: V. Krishnaswami, a longtime resident in our Metro area, grew up in Tamil Nadu. Sanskrit was his second language in high school, and also at the Loyola College, Chennai. He was taught Sanskrit at home by both his grandfather, an erudite scholar in the language, and his father, who was well versed in both Sanskrit and Classic Tamil. Both were lawyers. Krishnaswami’s interest included Kavyas (poetry), scriptures, stotras (hymns)… He has read Sanskrit dramas in the original — the works of Bhasa, Kalidasa, Dandi and Bhabhuti. His interest in Appayya and Nilakantha Dikshita started when his grandfather taught him Nilakantha Dikshita’s Shanti-vilasam. He feels that Sankara’s Brahmasutra Bhashya is a masterpiece in literature, logic and hermeneutics (the subject dealing with the theory and methodology of interpretation wisdom literature, and philosophical texts). 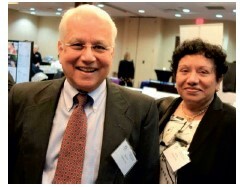 Krishnaswami came to Pittsburgh in 1973 as a fellow in cardiology at the then Presbyterian University Hospital. He practiced cardiology in Pittsburgh at Mercy and UPMC between 1988 and 2017. He was a clinical professor at the University of Pittsburgh’s School of Medicine. Now retired, he was involved in teaching and research all through his career. If you poll the people in India where Sanskrit as a language is well known even if not spoken or understood, about Sanskrit poets, I will be surprised if they can name anybody beyond Kalidasa. Some may have heard of Dandi, Magha, may be even Bavabhooti. Sanskrit poesy appears dead after the time of these masters. But hat is not true. It was prevalent in religious works of Sankara and his disciples in 8th century, Ramanuja (9th/10th century) and later, Madhva in 11th century. Many people wrongly think there was no Sanskrit poetry after 12th century. even though it was not flourishing. Tulasidas Goswami (16th century). Muthuswami Deekshitar (18th century) are great Sanskrit Bhakti poets. Nuilakantha Dikshita was a Sanskrit poet, born in South India in 16th century. He was born in the illustrious family of Appayya Dikshita. We know that he was born at the end of 15th century and lived to about middle of 16th century. Neelakanta was a genius, great poet, philosopher and a distinguished statesman. He was the chief administrator during the rule of Thirumala Nayaka, ruler of Madurai, a splintered state after the collapse of the Vijayanagar empire. Impressed by the young Nilakantha’s exposition of the text Devimahatmyam, the King Tirumalai Nayak was so impressed that he offered him a position as an administrator in his kingdom. His exquisite poetical works go beyond Bhakti, and are known for their humor, suggestion, sarcasm, Slesha (double entendre) — all in measured quantity. His works include plays (his magnum opus being Nalacharitra Nataka) epic poems like Siva-leela-arnavam and Gangavataranam. His minor works include Kalividambanam, Sabaranjana Satakam, Santivilasam reflecting the hypocrisy in the society in Kaliyuga among various professions. Some of his works are not extant and some only partially available. Neelakanta Dikshta’s poetry is like honey in a bottle. The pleasure starts right with the look, easy to obtain and sweet, unlike the works of some great poets. For example, Bhavabhuti whose works are heavenly, are like cool coconut water in summer, but you have to get the fibers out and break the shell before you enjoy it. Dikshita’s style is simple, his words are fluent and spontaneous coming from the heart (Sahrudaya), with not much of grammar problems. His descriptions of nature in Gangavataranam is splendid. He also wrote heart-melting Bakthi poetry in which in spite of all his scholarly understanding of the Upanishads, he makes a case that one can attain liberation only by totally surrendering to God and through His Grace — Her in his case, since he was a bakta of Goddess Meenakshi, the presiding deity of Madurai temple) — and not by Gnana (knowledge) alone, somewhat akin to Martin Luther’s idea of Grace. How many different recensions (Shakha) there are in the Vedas! How many different Upanishads in each of these recensions! How many births will be needed for mere rote learning of these texts — Not to speak of the study to understand their meaning! In this profound verse the poet rhetorically says, any amount of knowledge acquired by the study of Vedic or other religious texts alone without God realization (for which you need God’s Grace) will not bring hope for liberation in this life. Editor: We will share with readers other examples of Neelakanta Dikshita’s poetry in the ongoing issues. All children are natural musicians. Obsession to music is what makes them talented. Right training and rigorous practice can make them performers, if they so desire. Bhamini and Vaishnavee, teenage daughters of Hema and V Sundararaman, gave an impressive debut vocal Karnatic duo recital at the SV Temple auditorium on Sunday, July 8, 2018. Rasikas, discerning and common alike, enjoyed the concert, encouraging them with well-deserved applause. Their Guru — Tirumala Penugonda Chakrapani and Seethalakshmi Madhavan — have given them a firm foundation in fundamentals of Karnatic music, further kindling their desire for creative music. “Creative” music, by implication, cannot be “taught.” Guru can only illustrate how to approach it. The student should assimilate these guidelines and practice creative singing with raga embellishment, neraval, kalpanasvaram, with the Guru and then by themselves, till they become confident that the rules and restrictions are not violated. Creative music cannot be memorized and reproduced, it is improvised on the spot. Bhamini and Vaishnavi began their concert with an invocatory sloka followed by a well rendered rare varnam in Kharaharapriya composed by musicologist Pinakapani. The fifteen krtis of various composers presented by the sisters, were all set to different talas and ragas. The kritis were sung with chittai (proper diction and precision); a proof of their rigorous practice. They delineated raga and svaraprastara for several kritis. Parvati Ninnu in the raga Kalgada, Muruga in Saveri, Ekkadi Narakamu in Nitimati (a rarely heard raga) were noteworthy. The well-presented center piece Kaddanu Variki in raga Todi with detailed alapana and neraval and the sisters singing complimentary one-avartana svaram were enjoyable. Their 3-hour concert with no break remarkably maintained a steady tempo throughout. The young, talented accompanying artists — Sarang Mulukutla on the violin and Ganesh Sankaranarayanan on the Mrdangam — supported the young singers very well. Anjali Bandi on the tanpura provided the critical shruti accompaniment. These five young artists jointly made the Arangetram to a near-professional performance. Editor’s Note: Vish Iyer, a physician, and Akila Iyer, a financial manager, live in Fox Chapel. Spirituality transcending religion, they say, is the goal they seek in life. 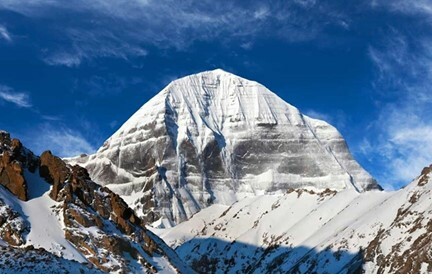 Mount Kailash is revered by millions of Hindus as the abode of Shiva. 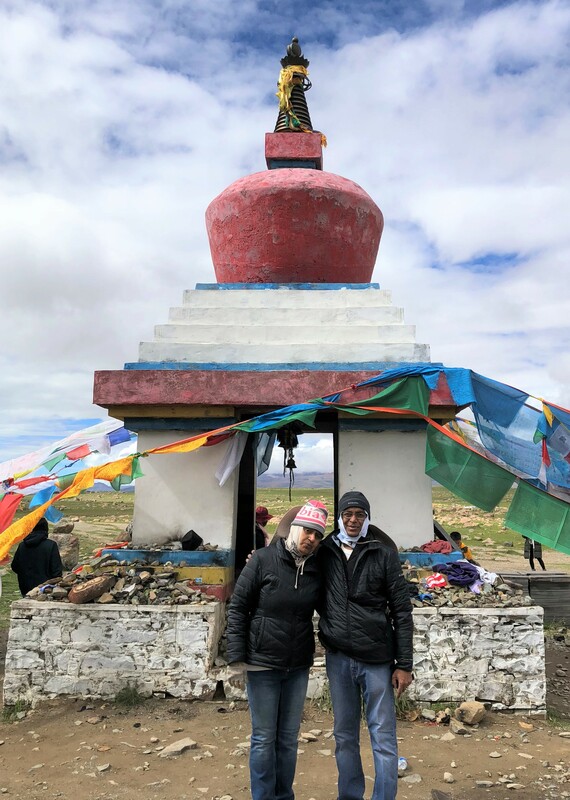 Pilgrimage to visit to this sacred mountain and lake Manasarovar is the life-long ambition, not only for the Hindus, but also Buddhists, Jains and the followers of the Kom religion. The authors at Yamadwar, the start of the Parikrama. The vedas, the sacred texts for the Hindus, do not start from the first word and end with the last one. Of the four. Rig, Yajur, Sama and Atharvana Vedas, Yajur Veda is widely practiced. Yajur Veda has 7 chapters and the middle of the fourth chapter is Sri Rudram. And the center of Sri Rudram are the syllables Si-Va. Thus around Si-Va is constructed Sri Rudram and around Sri Rudram is constructed the Veda. For the first time ever, Atirudra Mahayagna — that is chanting Sri Rudram 16,461 times — and performing Havan was organized at Mount Kailash, for world peace. Chanting Sri Rudram invokes Siva Himself and performing Yagnam (Homa) simultaneously ensures His presence. Getting to Tibet is either via Nepal or China. We chose the Chinese route, which requires that we had to go as a group, since individual permits are not allowed in Tibet. Lhasa, the beautiful capital of Tibet, is filled with lovely people who are culturally conscious. Chinese presence is felt in every aspect of day to day living. The Potala Palace, the headquarters of the Dalai Lama is occupied by the Chinese. 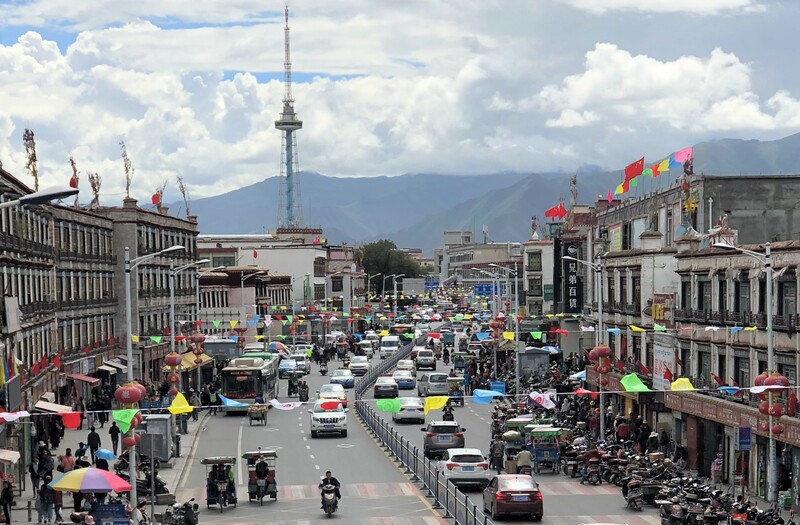 A busy thoroughfare in Lhasa, Tibet. After acclimatizing for a day in Lhasa, we proceeded by road to Xigatse. The mighty river Brahmaputra gave us company during the long drive. After a night of acclimating in Xigatse, the next night was spent in Saga. Electricity is available only from 8 PM to midnight at Saga and other towns above this altitude. A majestic view of Mount Kailash, the very purpose of our trip. 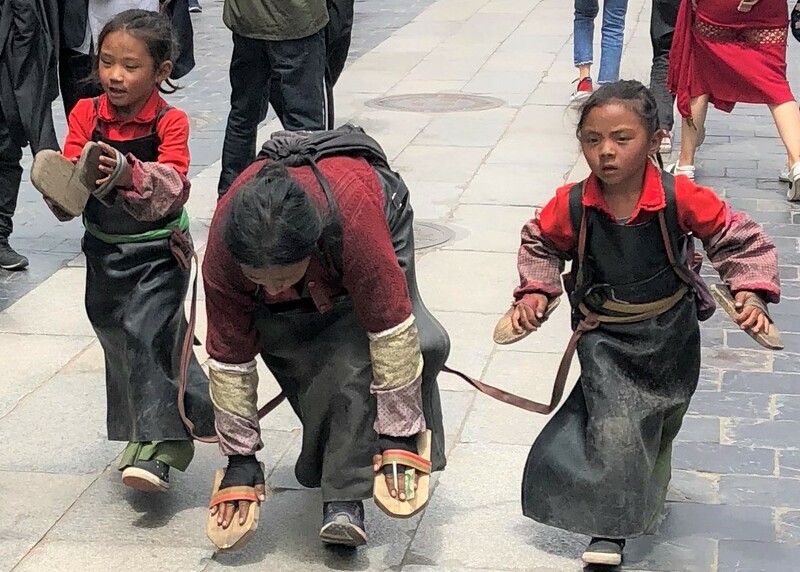 A Tibetan Buddhist, with help from her two children, doing the parikrama. for every four steps, she does an Pranam. with life and there are birds and other forms of life. While Lake Rakshastal is devoid of any form of life. The legend goes that the waters of lake Rakshastal is unfit for consumption as this was the place where the demon king Ravana did his penance and lifted Mount Kailash. And, the legend goes, Ravana got punished by Lord Siva who squeezed Ravana under the holy mountain. Our base camp at Darchen is situated at an altitude of 16,500 feet. The partial pressure of oxygen gets low at these altitudes and any form of physical activity takes lot of effort. Many moons ago, as a young Captain in the Indian Army, I’ve experienced it along the Chinese border in Sikkim. Because of various delays in delivery of Yagnam materials and other logistical hurdles, the Yagnam was delayed. We embarked on a 3-day Parikrama of Mount Kailash with basic supplies including plenty of high calorie food for the arduous trek. Each pilgrim had a porter who would carry a small backpack. 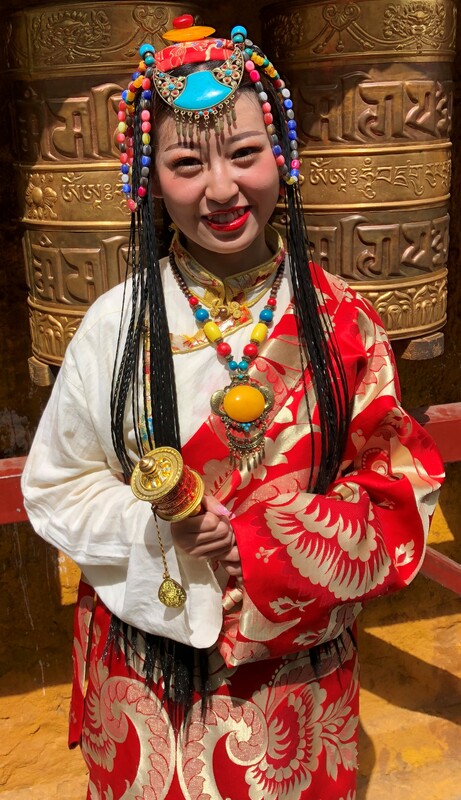 A Tibetan bride on her Big Day in he traditional Braial dress. In addition, there was also a horse and the horseman as a back-up, if one is unable to walk. The starting point was Yamadwar near Darchen. A Buddhist Temple along the way. that is quite compassionate and the other is Black Bon. Interestingly, those who practice Black Bon do the Parikrama in an anti-clockwise direction. Their practices are somewhat similar to Islam. At the end of the first day, we spent the night as close to Mount Kailash as possible near the north face with a divine darshan of Mount Kailash. 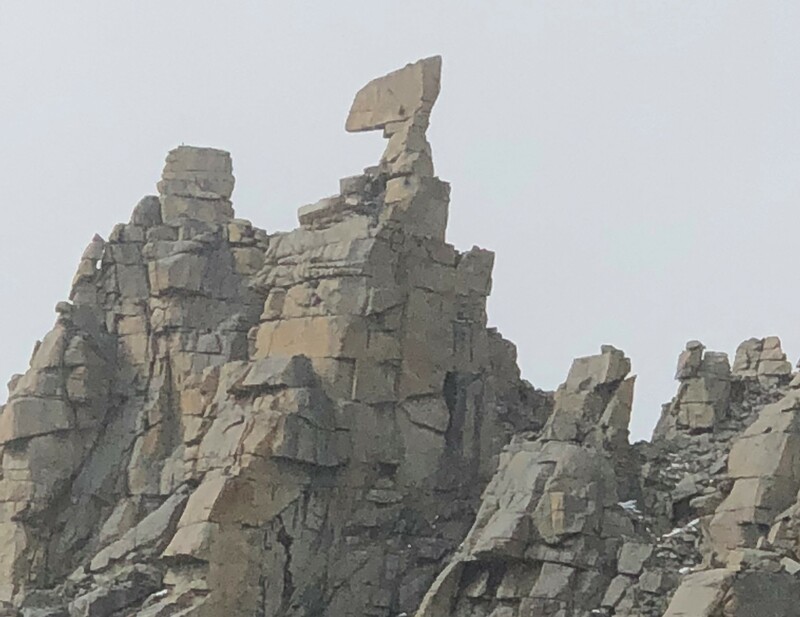 The Hayagriva Mountain Peak, a work of art by Nature done over thousands of years in bone-chilling cold and blistering winds. holy sites of Hayagriva who they recognize as an incarnation of Lord Vishnu. Yaks, the beasts of our burden, very critical for our trekking. was literally nonexistent. Plenty of fluids and prophylactic medicines to prevent high-altitude sickness are vital. involved another 20 km of trekking. At the end, it was a welcome sight to see the waiting buses to take us back to Darchen. 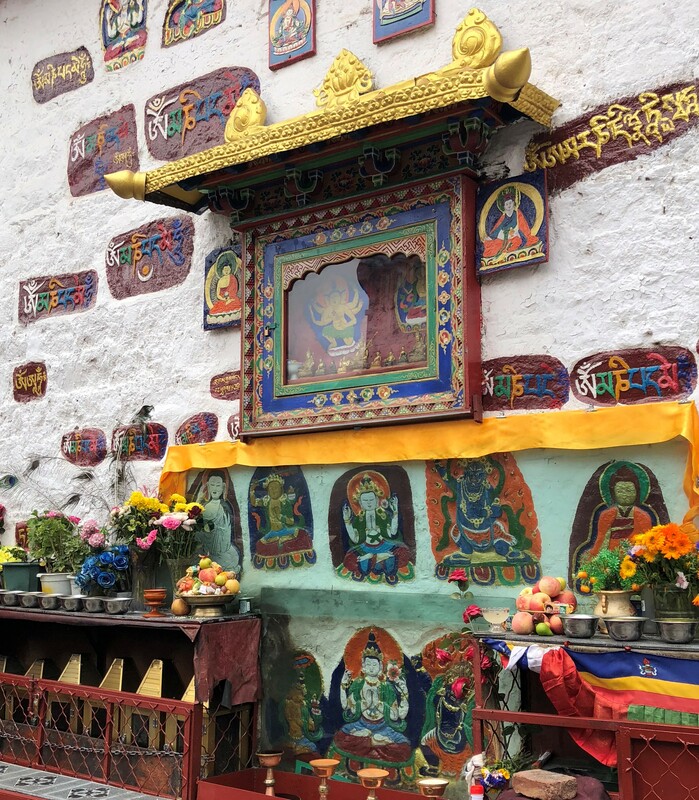 We thanked our porters and horsemen and reached Darchen. Shame on Patrika becoming anti-Trump mouth piece for Indian Diaspora in the Allegheny County. U.S. economy return 4.1% growth and now average 3.1% growth for the last six months. U.S. economy couldn’t rise above the 2.2% doldrums of the Obama years. Tax reform broke the bottleneck on capital mobility and investment from the highest corporate tax rate in the developed world. 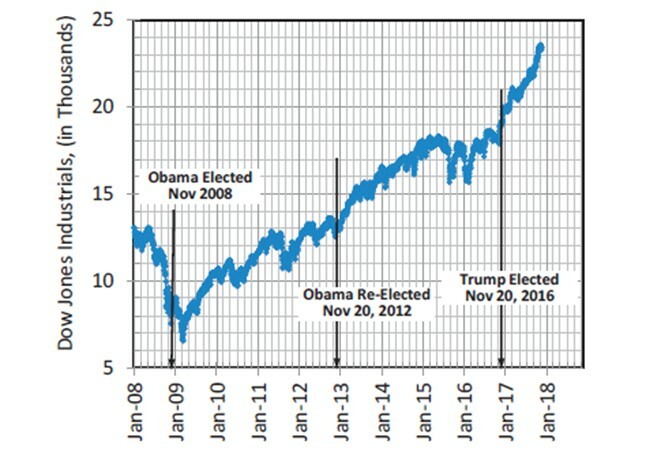 Tax reform and deregulations have lifted U.S. Economy from Obama/Clinton doldrums. Stop playing identity politics or caste politics like Democratic Party. As we all know, changes in these numbers (upward or downward) have multiple contributing factors, some domestic, and others, on account of events and trends occurring in overseas. Very often, the ruling establishment have no influence over these events, not to speak of any control. Discerning readers and those in the know of the rules of engagement in politics know that this strategy is how the game of politics is played. 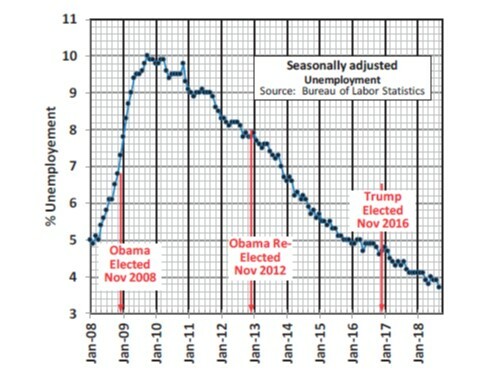 When Trump and his supporters take credit for economy doing good (as the writer above does) under his watch (whether he has anything to do with it or not), they should extend the same courtesy to Obama, again whether Obama is directly responsible for these numbers or not. So, we feel compelled to share with readers some of the general observations we have already published earlier on the eight years of the Obama Administration and the two years under Trump. Why Is Coronary Heart Disease Such A Big Problem Among Indians? Editor: Padma was born in Nellore India and grew up in Pittsburgh. She earned her medical degree from the University of Pittsburgh in 1992. She is a full-time gynecologist in the Hudson Valley area, married to her physician-husband for 25 years. She has two kids in college. She practices yoga and is dedicated to teaching people about the benefits of a plant-based diet. She has a website (www.drpadmagarvey.com). Asian Indians have some of the highest rates of coronary artery disease and diabetes in the world. I know from personal experience that many Indians are lulled into a false sense of security because they tend to be vegetarians. My own father, the late Dr. K N Rao, had diabetes. Eventually, he needed bypass surgery, but this extended his life by only two years. In addition, those two extra years of life were spent confined to a bed. Though my father had always been a strict vegetarian, he ate a high fat diet. Dinners included chutneys, ghee on lentils, fried papadam, fried pooris, tamarind rice with lots of oil and white rice, fried samosas, sugary laddoos, sugary jilebis, and yogurt. In addition, the typical Western snacks crept into his life. He ate potato chips, ice cream, candy, and cakes. There is lot of misinformation about what a healthy diet includes. We hear fat is bad, fat is good. We hear that carbs are the enemy. We hear that protein-centered diets like the keto diet or paleo diet are bad for us. In actuality, the evidence regarding a healthy diet has been known since the 1930s when Dr. Ancel Keys conducted the famous Seven Country Study. Keys found that countries that consumed low fat diets had better health than countries that consumed high fat diets. In particular, Keys found that the Okinawan and Mediterranean diets in 1930 were extremely healthy having 10-18% total fat. I came across an interesting study published in the prestigious medical journal The Lancet in 1959, entitled “Serum Cholesterol, Diet, And Coronary Heart Disease in Africans and Asians in Uganda” by Shaper et al. At the time of the publication of this study, coronary heart disease (CAD) was nonexistent among African Ugandans. This alone is a shocking statement since CAD is the Number One killer of African Americans today. While CAD was nonexistent in the African community, it accounted for 43% of all deaths over the age of 30 among Asian Indians in Uganda at that time. The authors examined the diets of the two communities. The African Ugandans ate a diet which included green leafy vegetables, maize, millet, yams, and beans. They ate very little meat and absolutely no dairy. They did not utilize much cooking oil in their cooking and consumed whole grains. In contrast, the Asian Indians in Uganda in 1959 were consuming white rice, lentils, butter/ghee, yogurt, milk, and lots of cooking oil. The total fat calories in the African Ugandan diet was about 18%. The fat calories in the Asian Indian diet in Uganda was 35-40%. The typical middle-class, vegetarian Indian diet is even worse today. In general, vegetarian Indians are consuming more refined grains, added sugars, oils, animal dairy, and even cheese. A low-fat, whole grain, plant-based diet has been the only diet ever shown to reverse heart disease. This study conducted by Dr. Dean Ornish was published in the Lancet in 1990. When it first appeared in The Lancet, the results were so startling that many in the medical community felt that it would revolutionize the way CAD was approached and treated. Dr. Dean Ornish even made it on the cover of Time Magazine with the subtitle asking if this was the end of heart disease. Unfortunately, the fact that Ornish published his ground-breaking research in the British journal, The Lancet, suggests that the American journals passed on it. Around the 1960s, most American medical journals, American medical societies, and even American medical school education were supported by the pharmaceutical industry. President Bill Clinton suffered a heart attack shortly after he left office. He had bypass surgery. After his surgery, he was on the standard regimen of medications including cholesterol-lowering drugs and told to follow the American Heart Association (AHA) diet. Interestingly, though the Ornish diet was the only diet ever shown to reverse plaques, the AHA recommends the less effective DASH diet. Clinton was quite frightened after his heart attack and followed his cardiologist’s recommendations. About 18 months later, President Clinton had a re-occlusion or buildup of plaque in his heart. He underwent angioplasty. I remember watching reporters questioning Clinton’s cardiologist at the time. The reporters wanted to know why Clinton had a recurrence of his heart disease despite following the AHA guidelines. The cardiologist said, there was nothing more that could be done about it and that Clinton had bad genes. Clinton was not satisfied with this response and talks openly about seeking other treatment options. Clinton came across the Ornish study and went to Dean Ornish for guidance. Clinton became a strict low-fat vegan. His daughter, Chelsea, is also one. Since following the Ornish diet, Clinton has been heart disease-free. The past president of the American College of Cardiologists, Dr. Kim Williams from Rush Medical Center says that there are only two kinds of cardiologists, vegans and ones who are unaware of the data. Indian physicians must be made aware of the proven benefits of a low-fat, whole grain, plant-based diet. We need to educate the Indian community as well as all our patients to avoid needlessly painful, early, and costly deaths. Excellent resources for more information are on the Physicians Committee for Responsible Medicine (PCRM) website. Editor’s Note: A slightly modified version of this article appeared in the April Issue of Hinduism Today. Death rituals — burials and cremations or other practices — are perhaps more for the living left behind to come to terms with grief and get a cathartic relief at the irrevocability of the Final Exit. For people who pass on in their 80s and 90s, the death rites are also occasions for great celebrations for reminiscing the lives of the departed. After all, the departed would have seen so much of life’s ups and downs, very personal griefs, frustrations, disappointments, excitements, successes, failures… … And touched the lives of many people in very many ways. A large proportion of Hindus use cremation for taking care of the dead. A relatively small fraction of Hindus also use burials. Traditionally, if people die in the forenoon or early afternoon, the cremation was expected to be done before sun down. For Jews and Muslims too, traditionally, the burials must be done before sun set, not always possible today. For the Hindus today in many places outside India, cremation or burial on the same day of the death is simply not feasible because of medicolegal requirements of hospitals, autopsy, death certificates, funeral homes’ requirements, etc. Typically, it takes two to three days to organize cremation in North America after the Final Exit. If long weekends intervene, cremation takes place only after four or five days after the death. This is the reality today. Further complication with Hindu cremation is that we need a pandit or a purohit to do the death-related rites for several days after cremation. In olden days when our ancestors lived in villages, on the day after cremation, the ashes were gathered and were sprinkled into the river or ocean, or lakes. Afterwards, there were daily rites for the departed for the next several days, at the end of which the departed Jiva was ritually merged with the departed ancestors. All these are called Antyeshthi karmas (NOT pujas). Then, on the 13th day in many cases, there is a formal puja invoking the blessings of Nature for people to come to terms with the death of the departed so that people can get on with their lives. This puja goes with various names in different parts of India. In cases where people in the prime of their lives suddenly die in accidents or under complicated medical conditions, “getting on with their lives” is not easy. It takes years to come to terms with cruel games Life/Fate/Bad Luck plays with people. A great many variations are there in the details of the rites from region to region and even within the region in different families with customs evolving over several centuries, compounded by geographic isolation. Even fifty years ago, for people who die after a long life, siblings and cousins, nephews and nieces, and grand-kids and also close friends assembled for the 13th day Pujas to joyfully reminisce the life of the departed. There is a great fellowship and camaraderie in these celebrations. The 13-day death rites and celebrations, which was OK during our countryside leisurely life, are simply not sustainable in today even in India, not to speak of Hindus living outside. There are several practical reasons: For starters, today, the members of the family are scattered globally. Further, people have only two weeks of paid vacations, and they have very busy work routines. Children need to go to schools and colleges. And people running shops or small businesses cannot afford to be away from their shops for long duration. Today, relatives — sometimes even siblings — rarely participate in all the key events such as the cremation itself, immersion of the ashes, and the 10th and 13th day events. It simply is not possible in contemporary lifestyle. The saddest part of the system as it exists today is that often the husband and wife, often in their 60s or even older, do the 9th and 10th day karmas (rites), and the 13th day puja all by themselves, or with very few people to give them emotional support. A great opportunity is thus lost for the extended family members and friends to commiserate among themselves during such a somber and evocative occasion. We need to remember that after the death of aged parents, the siblings slowly and naturally drift away from each other in the normal course of the flow of Time. So, the 13-day death rites even for observant Hindus, for all intents and purposes, are already modified to varying degrees to to accommodate the present day constraints and lifestyles. Given our changed lifestyle today, it is time that we are honest to discuss in the open the need for reform on death rites. We need to come up with a set of shortened and reformed death rites that will be an alternative optional standard for all Hindus who cremate/bury the mortal remains of the departed Jiva. In stating this, I am NOT suggesting any radical change Those who want to do in the traditional 13-day event may continue to do it that way. However, for others who have other constraints as listed earlier, we can come up with death rites that can be done, say, within three days after the cremation, while still retaining the key elements of the 13-day events. Thus, the whole sequence will be completed within three (or four, or five) days after the cremation, which is a more manageable time-wise for all extended family members to participate. A shortened death rites will greatly help all relatives to gather for all the death rites and observances and celebrate the life of the departed. It is not fair to place the onus for shortening the rites on the individual Pandits/Purohits. They are already caught between a rock (their traditional training in pathashalas) and a hard place (their clients asking for all kinds of compromises). They have their own ethical codes that they do not want to drift too far away from unless they get social approval for the shortened version of death rites. We need to ask for it. That is why we, the Hindu faithfuls, need to make an acceptable compromise on the core steps involved in death rites. Again, those who want to follow the 13-day practice, can continue to do so. We need to meld these rites into our contemporary lifestyle and fit them into 3 or 4 days after the day of cremation. Are we ready for discussing this in the open? Remember, the 3- or 4-day marriage events of the olden years has been seamlessly shortened to 1-day or even 1/2 day event today to fit our convenience. Editor: Raashmi Krishnasamy, currently a senior in Cognitive Neuroscience major at Carnegie Mellon University, is a passionate advocate for mental health, particularly within the South Asian community. She aspires to combine her knowledge of neuroscience with public health to provide more equitable access to healthcare for individuals with mental health problems. She is dedicated to preserving her Indian cultural roots through activities on and off campus. Currently, she is the Co-Director for Bhangra in the Burgh 12, a nonprofit Bhangra competition hosted by Carnegie Mellon and Pitt students to raise money for the Creative and Expressive Arts Therapy program at the Children’s Hospital of Pittsburgh. The World Health Organization’s recent report says that by 2020, depression will be the 2nd leading cause of disease; by 2030, it is set to outpace heart disease as the #1 cause of disease worldwide. An estimated 97.5 million people are suffering from mental illnesses in India alone. The incidence of depression is about one in every twenty Indians — roughly 5% of the country’s population. And it’s only getting worse. Chidren of our Bharat Maata is suffering from a serious mental health crisis. Why is the birthplace of yoga, meditation, and mindfulness also home to about half of the global mental illness disease burden? And why hasn’t it shown signs of stopping? The answer is simple – our attitude. We fear sharing our feelings with others. We judge and fear judgement towards individuals with mental illness. But most importantly, we fear ourselves, and fear admitting that we may actually need some help, after all. All of this fear contributes to strengthening the stigma, forcing us further and farther away from what we really need—direct confrontation. However, we’re a long way from tackling this issue face-to-face. According to the Live Love Laugh Foundation, in a survey of 3,556 respondents from eight cities across IAndia, 47% could be categorized as being highly judgmental of people perceived as having a mental illness. Of the 47%, respondents were more likely to say that one should keep a safe distance from those who are depressed, or that interacting with a mentally ill person could affect the mental health of others. And the worst part – 26% were categorized as being afraid of the mentally ill. But are we afraid of people with diabetes? Or hypertension? Why should we view mental illness any differently? Like any other chronic illness, mental illnesses have both a behavioral and a physiological component. The only difference here is that instead of focusing on the heart or pancreas as in the case of heart problems and diabetes, the area of interest in mental illness is the brain. In the mental health issues among Indians, when does it all stop? When does the fear stop and the courage begin? When do we stop being afraid and start being brave enough to confront our inner demons? How do we stop taking step backwards and start to move forward in our fight against this disease? I offer somewhat of a trivial solution: let’s change the way we view mental illness and begin to treat it as a worldwide epidemic. The formal definition of an epidemic is the widespread occurrence of an infectious disease in a community at a given time. That is precisely what mental illness is – it’s a widespread, infectious disease, plaguing not just one community, but hundreds of thousands across the globe, right now! Thankfully, when it comes to mental health, we don’t have to do all these 3 things – we only have to do one; we must change group norms. But just how do we go about changing group norms? They say that the hardest thing to do when it comes to treating a mental illness is acceptance – by the individual. But it’s bigger than that; it has to do with group [or socia]) acceptance acceptance. We must look not only look beyond ourselves, but also within ourselves. Group norms aren’t something that just change overnight. They begin with the individual. Changing the way we view ourselves will allow us to see what Krishna preaches in the Gita — we will begin to see others as being equal in suffering. Pittsburgh area who have known Dr. Nathan’s accomplishments for many years were gratified to see this richly deserved honor bestowed on him by his professional peers. True to his characteristic humility, Dr. Nathan credits his several mentors he was fortunate to have had in his life. For the Pittsburgh Indian community for a long time, Dr. Nathan has been the “Go To” psychiatrist during times of distress and misfortune. He was always there to guide through difficult transitions with his expertise and appreciation of the difficulties with our unique cultural differences. For several years, Dr. Nathan worked with children in the Temple youth camps and was very popular with children for his understanding of their concerns. Dr. Nathan came to the US in 1973, armed with a medical degree from the Stanley Medical College of the University of Madras and accompanied by his new bride, Dr. Girija, his heart throb in college, to start his residency in psychiatry in New York, followed by his fellowship at New York State Psychiatric Institute and Columbia University. He was an Assistant Professor of Clinical Psychiatry at Columbia until 1980. Dr. Nathan came to Pittsburgh in 1980 to be an Assistant Professor of Psychiatry at the University School of Medicine and Western Psychiatric Institute and Clinic and served as a Medical Director at Western Psych. He then moved to Allegheny General Hospital to become Vice Chairman, Department of Psychiatry and Professor of Psychiatry at the Medical College of Pennsylvania and Hahnemann University. Currently, Dr. Nathan is retired and enjoying a life of leisure with his wife Girija and nurturing their two lovely grandchildren. In every election, as a matter of routine, we need to show our faces at the polls to tell everyone that we take our civic duties seriously. Besides, being a relatively new group of immigrants into this these great United States, showing our faces at the polls is one sure way to slowly get acceptance into the American mainstream. In addition to the above Boiler Plate need for us to go to the polls, the coming midterm polls this November is important for one additional reason as well. The Pennsylvania state supreme court has redrawn the maps of the Congressional districts in Pennsylvania this year to reflect the voting patterns for offices elected by state-wide voters such as the offices for the governor, US senators, and attorney and auditor generals. We discussed this in a lengthy article two issues ago. See here for the article. In the past, the GOP-controlled Pennsylvania state legislative bodies in Harrisburg, using its majority in the state legislature and with help from the GOP governors, managed to gerrymander the Congressional district maps and gave undue advantage in sending a large contingent Republican member to the US House of Representatives in Washington, DC. Thus, in a moderately center-right state that is Pennsylvania, Republicans garnered 13-5 advantage by the blatantly skewing the congressional district maps in their favor. The redrawing of these maps is mandated to be adjusted based on population changes revealed in the decennial census. With the redrawn maps for the congressional districts, now GOP has only a 10-8 advantage in the congressional delegation. The delegates elected in the upcoming November election is more likely to be representative of the broad electorate of the state. You are currently browsing the archives for the October 2018 category.